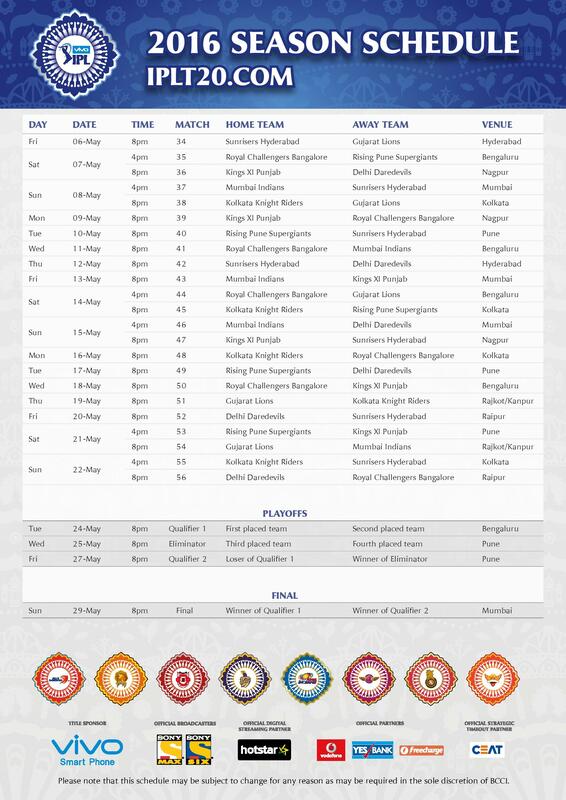 VIVO IPL Season 9 2016 Time Table – Schedule | Match List, Fixture in Image: Indian Premier League Season 9 Complete Schedule has been launched by BCCI. VIVO Smart Phone is the Title Sponsor of IPL Season 9 2016 while official broadcasters are Sony Max and Sony Six. IPL 2016’s Official Digital Streaming Partner is Hotstar, Official Partners are Vodafone, Yes Bank and Freecharge and Official Strategic Timeout Partner is CEAT. Gujarat Lions and Rising Pune Supergiants are the new teams set to take a part in this season. Checkout more useful information about VIVO IPL 2016, such as VIVO IPL 2016 Teams, Team Players, Complete Schedule etc. Rahul Dravid lead DD as a mentor. KL Rahul and Rasool will play for RCB in IPL Season 9. Saurabh Tiwari and Albie Morkel will play for new team Rising Pune Supergiants (RPS). David Miller will lead Kings XI Punjab (KXIP) this IPL season. Virender Sehwag to mentor Kings XI Punjab. New Zealand former captain Fleming join Pune Franchise as a coach. MS Dhoni to lead Rising Pune Supergiants (RPS).